This is the July Anode for 2013 in html format. If you know of a new member, please forward this link to them. try Amateur Radio as a rewarding hobby. Like it or not, the Anode has to change with the times. As a hobby, Amateur Radio is changing rapidly as technology changes. We should try and keep up. When I started the new Anode in 2000, I did not think the format would change from the long standing one. But it did. Once upon a time this was typed on a typewriter and 'Roneo-ed' off to be mailed to members monthly. Later it was typed on a typewriter and then photocopied on a Xerox machine. And then mailed by the Postal service to members. The cost of mailing was not onerous as many people used it. So the costs were spread over many 'clients'. With the advent of email, things started to change quite rapidly. Printed copies were replaced by Portable Document Format (PDF) files. When I started sending the Anode out, I kept the file size to below 0.5MB. As most members were still on 'Dial up'. Also in those 'early days', I used a desktop publishing software package called Microsoft Publisher. It came with my copy of Microsoft Office 2000 Professional. This laid out the Anode in a nice format and outputted the file in Postscript format. Postscript is what the lasers use to set up pages before throwing carbon granules at the paper. It is the base of a PDF. So a quick transformation to PDF was done by GhostScript/GhostView. This last piece of software was 'Open Source' and free. When my office applications started to crash for no apparent reason. The help would send you to the Microsoft Office upgrade site, to get you to buy the latest version. I turned to using the Open Office package. But this did not have a 'Publisher'. It did however have an export to PDF function. I carried on using Microsoft Publisher. I tried out new layouts on various members. I got no reaction. Finally I got some positive feedback for a new format that I had laid out in the Open Office word processor. I believe the time has come to change the Anode's format once again to a multi-contributor blog. Having more than one 'contributor' will mean fresh articles and news. No longer will the members wait for a whole month for the latest articles and news. Amateur Radio is progressing at an ever increasing rate. It is no longer 'wireless' nor Heathkit construction projects. There are still unexplained and untried areas. One of which is the compact H.F. Aerial for use in cluster housing areas. Recent events in Amateur Radio have shown me that the latest and most exciting developments are in the use of technology available right now. Software Defined Radios (SDR) are being released at an ever increasing rate. Use of small micro systems such as the Raspberry Pi for various functions are appearing on the web sites daily. In South Africa, we have an 'issue' with high technology and electronic components. We remain a small market with very few friendly manufacturers. When a chip gets used overseas for a new and low cost SDR, we will not see that chip here until it is used in a mass produced box. A recent example is the Realtek RTL2832U which is available overseas for $20 (R200). This chip can do the SDR function from 54MHz to nearly 2GHz. It even has a USB2 interface! So you can plug it into your tablet and listen to the Sunday bulletin on 2 metres narrowband FM. Noel Hammond ZR6DX, gave an interesting and well presented talk on Digital Modes in amateur radio at the West Rand Club House. Noel spoke on everything from the beginning of digital modes, their inception and progression, right up to their use in modern day amateur radio. The main object of this talk was to introduce fellow hams to the digital modes world, using Ham Radio Deluxe's digital modes software called DM 780 (Digital Master). We were guided through everything from the initial setup, basic operations, use of macros and most of the important functions one would generally us. The different digital modes used, as well as band width per mode, the speeds of each and their general usage throughout the HF bands were explained. The main focus was PSK31 and RTTY as these seem to be the most popular modes in use today, however there are many to choose from. Noel also delved into the setup of the logbook functions in HRD and the syncing of this logbook with online sites such as qrz.com and lotw.com (Logbook Of The World). Noel demonstrated how each copy or backup of a logbook is made and the advantages of using the online resources to streamline your digital logbook and make sending and receiving of operator/station data while using Digital Master or HRD simple and effective. The basic setup required to connect a radio to your pc using CAT and sound card interfaces was also explained during the talk. Noel described how these can be purchased locally or online, and that a home brew version is simple and cost effective to build. Phillip ZS6PVT was on hand with home made interfaces which he made available to those present. Along with the talk we were provided with a CD containing all the software needed. Also included were PDF documents which included everything from schematics to course notes. A detailed 50 page booklet was handed out which followed along with Noels Power Point presentation for easy reference. At the end of the day, an HF station was setup and PSK31 was demonstrated live. Those who stayed were given the opportunity to make a few digital contacts. Overall the talk seemed to inspire all those present, and the response was extremely positive. Noel should be commended for the amount of work he put in to presenting an informative and easy to understand talk on Digital Modes and HRD. At the end we were all more knowledgeable in the use and operation of digital modes. Here is what a fellow attendee had to say on his blog regarding Noels talk. Noel plans to hold another digital talk in the future due to popularity and interest in this one. Keep your eyes and ears open for more info. I made an EH antenna for 14Megs to a variant of the W0KPH design. It's a similar concept to the CFA. www.b-howie.demon.co.uk/EH_14MHz.JPG .It's about 40cm long . It looks a bit foosty as it was outside for about 6 months. voltage at the ends . The length of the dipole gets the 90degree phase shift. The EH antenna does this by moving the ends of the antenna closer together by a combination of capacitance and inductance loading. It's not fundamentally wrong, it's just not as efficient as a resonant dipole. It radiated and received OK and didn't get hot even with 200W going into it. I managed to work a few people on it. I've got some aluminium beer cans and was thinking of making one for 10MHz to use on WSPR. I don't think I'd spend good money on any of the commercial ones. Anyone else tried one ? I did a search (on Google) for “Phase Detector”. I got very little in the way of circuit examples or explanations. Why use a phase detector, instead of an S.W.R. Meter? Going back to basic principles, you need to find the 'resonant frequency' of your aerial system. If it were a simple tuned circuit, at the resonant frequency, the reactances are cancelled out. The circuit becomes resistive as L and C resonate. The resistance won't be exactly what you want of course. It will need matching to the feedline. Also thanks to Murphy's Law, the resonant frequency won't be in the Amateur Band. This is why you use an aerial tuner. The diodes are OA91 or similar germanium diodes. Suitable for QRP work up to 10 Watts or so. The transformer is a current sensing transformer. The load voltage portion is used to switch on and off the diodes. This switched or chopped current waveform gives an output voltage that reaches a maximum at + and – 90 degrees phase. When the current and voltage are in phase or anti-phase (180 degrees) the output will approach zero. 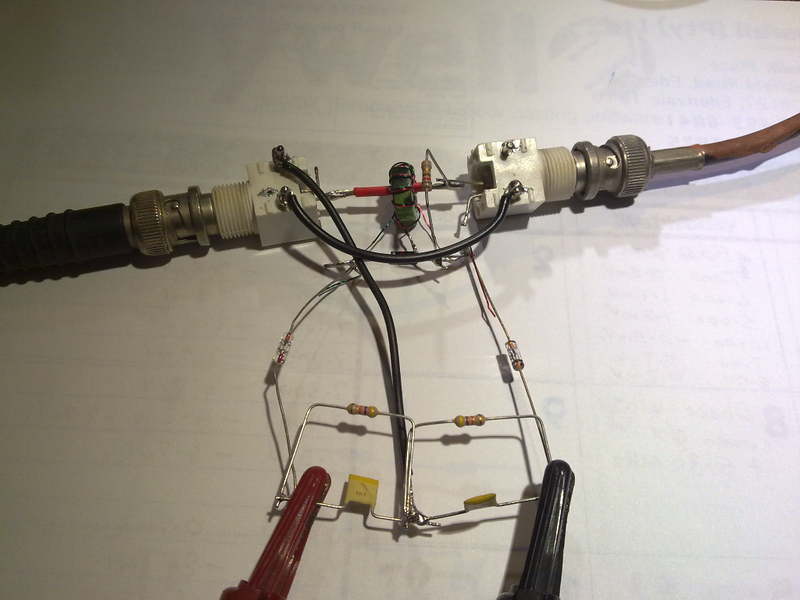 This 'simple' circuit was fed from a signal generator at 0dBm to +10dBm and the frequency set to 7.000 MHz. With a 51 Ohm resistor as a 'load', it gave a reading on the DVM [Digital VoltMeter] of a few millivolts. Connecting a 220 pF capacitor across the 'load' gave a larger reading. As did an inductance of 2.5 uH connected across the 'load'. The readings were small but of opposite polarity. I found that as the signal generator was just about turning the diodes on, the voltage feed needed to be an 820 Ohm resistor and the other resistor an open circuit. Infinity Ohms – badly drawn on the sketch. Yes, I could have put more turns on to the toroid to build up the inductance. But I was aiming for a 'test circuit' to prove the circuit. 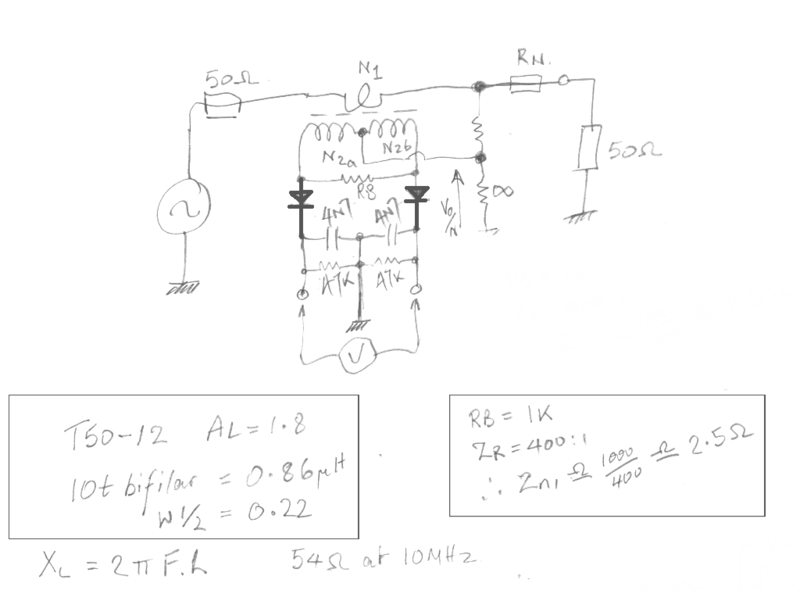 It works and is really only suitable for QRP operation and shows the basic circuit in operation. The circuit needs to be made more 'sensitive' to the zero / 180 phase shift point. So I am going to develop the circuit further. I will let you know what I find. To make this the best ham radio magazine in South Africa we need your input. Please submit articles, comments, suggestions etc. Please send plain text with no formatting to the email address below. See Club website at www.zs6wr.co.za for all ANODE back issues. Just what is " homo ludens radiactivus " ?